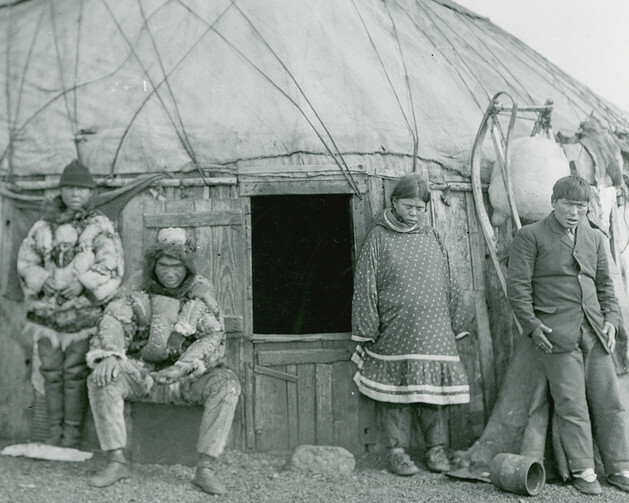 Akulki (second from left) and his grandson Uusiiq (left) wear birdskin parkas. Gambell, 1912. A coat required about eight-five crested auklets, thirty-five murres or puffins, or twenty-five cormorant skins, all stitched together with whale or reindeer sinew. Courtesy of the National Anthropological Archives, Smithsonian Institution, INV 1480400.